Swoop through the skies of Gotham City, and battle the Joker in this deluxe Batman costume. 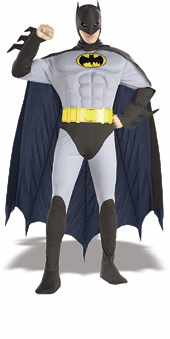 Comes complete with headpiece, cape, muscle chest jumpsuit with attached boot tops and belt. Size: Small - fewer than 5 available for next day dispatch.